Christine Paradine first became involved with the rescue and care of animals when she joined the team at the Devon-based animal charity Animals in Distress on a voluntary basis. She helped to set up their rescue centre, and for more than 20 years she devoted a large part of her life to caring for abandoned and neglected animals of all kinds. 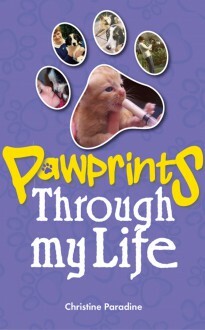 Pawprints Through My Life is an account of Christine’s many adventures with the animals that came to the centre. It tells of some of the challenging, emotional and amusing and sad experiences of her years with the charity, and of some of the wonderful dogs, cats and other creatures she encountered.